Monitor and clean out your gutters at least twice a year. This gutter failure began with downspouts plugged with overgrown foliage. Water leaked from the gutter and ran back onto the soffitt. Over time this delaminated and failed. Routine gutter maintenance is one of the most often overlooked jobs around the home. 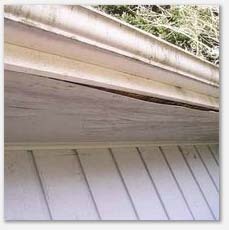 Make sure all gutters are cleaned usually 2 times a year, more depending on the number of trees dropping debris, etc. They should be all properly attached, no sagging low spots, with proper downspouts & splash blocks or other suitable drains Read more about keeping up your home in our newsletter.